Welcome to Tailgate for Something! This year we are asking for a donation ($10 suggested for each car) that will be given to charity (we selected one, but we are waiting to make sure they are comfortable being associated with Hoosier Beer Geek). And, as usual, it is a sharing event. That means you bring beer (it doesn't have to be rare or extreme) and you bring food (it doesn't have to five star) and you share it with everybody. Because they will share with you! 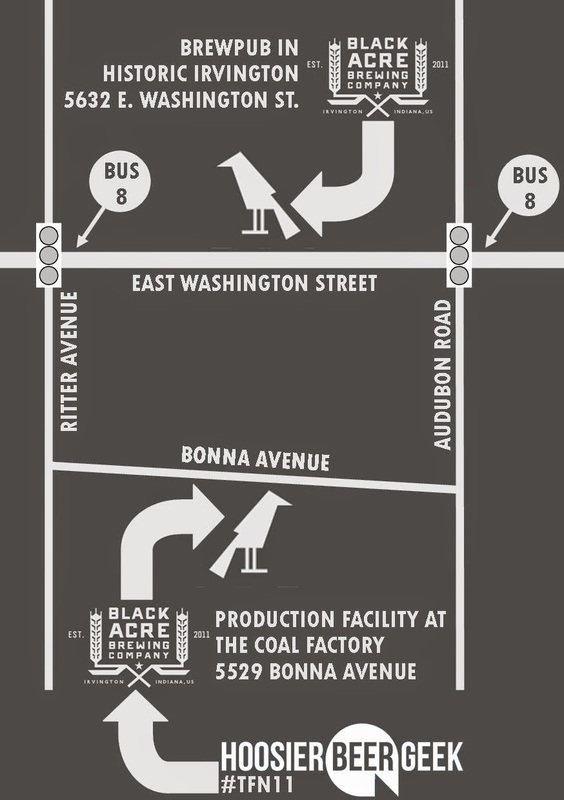 #TFN11 will be at Black Acre Brewing Company's new production facility at The Coal Factory (5529 Bonna Avenue, Indianapolis 46219), located 2 blocks south of their Historic Irvington brewpub. 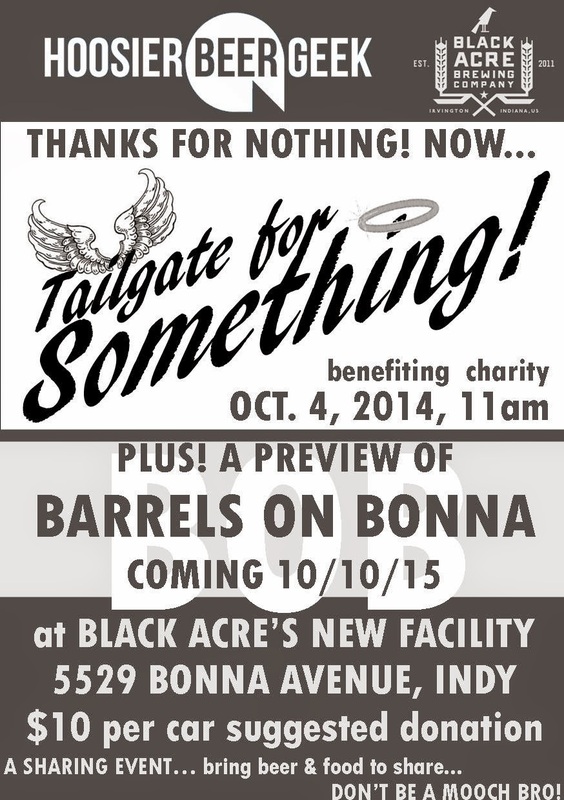 Along with tailgating, you will get a chance to see the "before" of The Coal Factory and Black Acre's new facility. So bring yourself, your friends, your beer, your food. Gluten-Free Beer - Looking for gluten-free beer? With the help of two of our bestest beer buddies, we provide you with a list of possibilities. Fumble: The Beer Menu at Lucas Oil Stadium - We take an in depth look at the state of craft beer in Indy's NFL stadium and those across the country. The Complete Works (so far) of Ted Miller (abridged) - We sit down with Ted Miller and get the whole story and history behind Brugge Beer. 36 Hours In.. - We reach out to our friends and compile the ultimate guide to drinking in three cities: Indianapolis, St. Louis, and Madison. KOTBR #132 - Thr3e Wise Men Golden Zoe IPA, Neil Patrick Harris Style - The title of this roundtable speaks for itself. KOTBR #90 - Medal Winners - We visit Barley Island and Brugge Brasserie in Broad Ripple to try some medal winning beers. Things get interesting when we are joined by some special guests, including Michael Phelps, Rob Halford, Glenn Danzig, and Brugge's very own Ted Miller. KOTBR #76 - Do This in Memory of Jim - We do a tour of Fountain Square, hitting the neighborhood's watering holes. This was our last roundtable at our beloved Deano's Vino (RIP). KOTBR #63 - Weird Party - We board our private jet, hire a spirit guide, and conjure up famous St. Louisians in order to review beers from the St. Louis Brewery. KOTBR #52 - Our Second Year Anniversary Party at Brugge Brasserie - A specially brewed Brugge Chelada, a crowd of 50 or so, four new Knights of the Beer Roundtable, and a lot of attendance prizes at our second anniversary party. Beer: The Pedal Pusher's Potion - Our first in depth feature receives support from Dogfish Head, Left Hand, Breckenridge Brewery, and Smuttynose, and draws in hits from hundreds of cyclists looking for a beer buzz. Five Great Gateway Beers: The Hoosier Beer Geek Alternative - Our guide through the beginning stages of beer geekery. Before CANvitational, get to know Sierra Nevada! Before Canvitational, get to know DC Brau! Before Canvitational, get to know Brewery Vivant! The Beer is . . . Good! 4.05 Mugs - He'Brew Bittersweet Lenny's R.I.P.A. 3.41 Mugs - Two Brothers Oh Brother! Yay Team. Simple theme. Powered by Blogger.